Sta Ana, Cagayan Valley Philippines. JAI-ALAI which the Filipinos have come to loved for the past decades Is back. The game is known as Bizkaia Jai Alai de Sta Ana Cagayan The games are being held at the main fronton, known as Sports Valley in Sta. Ana, Cagayan. 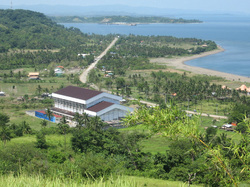 It is under the jurisdiction of Cagayan Economic Zone Authority that by virtue of a law, Sta. Ana area in Cagayan will be developed as a major transshipment port and a gaming hub for Taiwanese and (mainland) Chinese tourists who frequently visit Sta. Ana for the beaches that could rival Boracay. For this reason, the management, Meridien Vista (who is headed by former world champion pelotari Toto Ricaguena of Spain) strongly believes that Jai Alai is here to stay. SPORTS VALLEY , is a world standard playing court complete with gym equipments and other amenities. There are a total of eight (8) foreign and twenty two (22) Filipino pelotaris divided into different categories namely Senior A, Senior B and Junior players. Sports Valley schedule lineup which consist of twelve (12) events or games to be played daily with each event having a certain number of players. Games are being shown live through GSAT dth channel 12 and more than 250 cable affiliates nationwide, while the special llave (last game) where 10 senior pelotaris race to win 12 points also aired nightly over Solar TV channle 9 and Solar Sports Cable. Jai Alai as a spectator sport that was very popular from the 50s to the 80s until it was closed down on 1986. The fast plays, the handsome Spanish and Filipino players . It was known as the Game of a Thousand Thrills, The Fastest Ballgame on Earth and Ballet with the Bullets. As the young generation goes into more daring and extreme sports, none would be more exciting than to be inside a large cancha or playing court to hurl or catch a pelota (ball) that travels at an average of 240 miles per hour.